Released: vCloud Director 9.5 - Full HTML5 Tenant UI, NSX-T Thoughts and More! - VIRTUALIZATION IS LIFE! Released: vCloud Director 9.5 – Full HTML5 Tenant UI, NSX-T Thoughts and More! Last week VMware released vCloud Director 9.5 (build 10266189) which builds on the 9.1 release that came out earlier this year. This continues to deliver on VMware’s promise to release major vCD updates every six months or so. This update completes the HTML5 Tenant Portal port as well as continuing to enhance the usability of the HTML5 interface by extending the Provider UI to be more functional. Under the hood there are a number of networking enhancements as well as the initial introduction of a vCD Cell Appliance. In this post, I am going to focus more on the HTML5 Tenant and Provider Portal as well as touch on some of the important changes to supportability this release brings. As you can see from the list above, there are a number of major features to talk about, and i’ll try to put together a few more posts over the next few weeks digging into them specifically. Starting from this release the reliance on the old Flex based portal is no more. All tenant tasks have been ported over to the HTML5 portal along with a lot of additional enhancements. If I think back a couple years ago when vCloud Director was at a cross roads in terms of how VMware continued to develop it, it’s amazing to see this new UI fully complete. Everything that Tenant’s could see in the Flex UI is present in the HTML5 UI. Some of the additions include a recent tasks pane, support for independent disks is not only an API only feature now and can be accessed via the UI as well as Affinity Rules being configurable from the HTML portal. You can also manage Catalogs and as with vCD 9.1 you can manage the Content Library through the provider UI. What else is new in 9.5 is the ability to allow the management of users, groups, roles, global roles. vCD 9.5 brings with it the end of support for Oracle Database which brings full circle the requirement for Oracle. Many of you who started on vCD when it was in Beta or v1 remember that it needed an Oracle database and didn’t support MSSQL. With the support of PostgreSQL it’s now ironcially MSSQL’s days that are numbered with 9.5 being the last release to support MSSQL as the vCD Database. For those that use vCloud Network Isolation (VCDNI), that is now also no longer supported as well as a continued end of support for Older API Versions with version 19.0 and earlier no longer supported. From a networking point of view vCD 9.5 is the last release to support the creation edge devices in the non-advanced mode which is effectively the old vShield mode. Only edge devices that have been created or converted to advanced will be supported by the HTML5 UI. from this the network configuration on tenant side is the same as with NSX-V.
NSX-T is something that VMware is pushing very hard now, and i’ll be honest in saying that i’ve not had a chance to tinker with it. I’m still very much in tune with NSX-v however it’s clear from the push of NSX-T into VMware Cloud on AWS and now into vCD that it is the network virtualization platform of choice moving forward…though I must check on the progress of the Edge devices. These are critical to tenant edge services that front a vDC and there is a lot of power in the current NSX-v edges. Current NSX Platform? Future Direction? vCloud Director 9.5 is compatible with the latest vSphere 6.7, 6.5 Update 2 (but not 6.5 GA) and NSX-v 6.4.3 and supports full interoperability with other versions as shown in the VMware Product Interoperability Matrix. Interestingly enough, 9.5 has more supportability for NSX-v and obviously with NSX-T having initial limited support. With regards to Veeam support, I am sure that our QA department will be testing the 9.5 release against our integration pieces at the first opportunity they get, but as of now, there is no ETA on offical support. There are only two resolved issues in this build and there are a number of known issues that can be found here. Overall this is again, a very strong release and it’s clear to now see that vCD is 100% supported and backed by VMware. You can start to see a shift of the platform away from just being an abstraction layer to becoming what could be a brokerage engine expanding on the extensibility thats being built into the product under the hood. 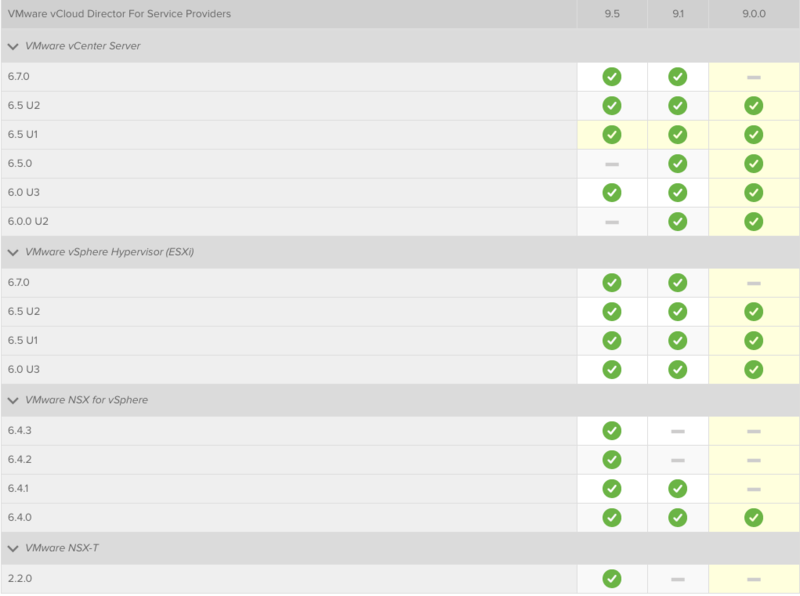 vCloud Director 9.5 continues to fulfil the promise of enabling SDDC functionality to VMware service providers. There is a White Paper where you can find more details about what’s contained in the 9.5 release. Tom Fojta and Daniel Paluszek from VMware have a what’s new blog posts as well. I got the OVA Vcloud director 9.5 beta deployed in a testbed. Is there a way to upgrade appliance to the final release of 9.5. So, how can be upgraded the VCD appliance ?